The 2017 racing season has finally started and ROWE RACING is back in action after a winter break of 125 days. In the first race of the VLN Langstreckenmeisterschaft on the Nordschleife, the team gathered a lot of valuable information while preparing for the highlight of the year, the 45th ADAC Zurich 24-hour race on 27th/28th May at the same venue. Both BMW M6 GT3s entered by the St. Ingbert based squad completed the 4-hour race distance of the 63rd ADAC Westfalenfahrt without major technical issues. This enabled the six drivers to kick off the season by collecting a lot of Nordschleife kilometres in racing conditions. In the end, they crossed the line in 19th and 25th positions, but the results are just a small aside to the comprehensive programme the team had worked on over the weekend. New team-member Marc Basseng drove his first ever race kilometres as a part of the ROWE RACING squad and in the BMW M6 GT3. The Nordschleife specialist, who has already celebrated one victory in the 24-hour race and a total of 26 wins in VLN, took the opportunity to get further acquainted with his new car in dry and sunny conditions. He shared duties in the cockpit of the #99 BMW M6 GT3 with Belgian BMW DTM driver Maxime Martin and British BMW works driver Alexander Sims. After starting from 27th on the grid the trio missed out on a slightly better final result because of an additional fuel stop before the final lap to make it over the line following an issue with the refuelling system on the previous stop. In the overall result, they were the third best BMW crew. 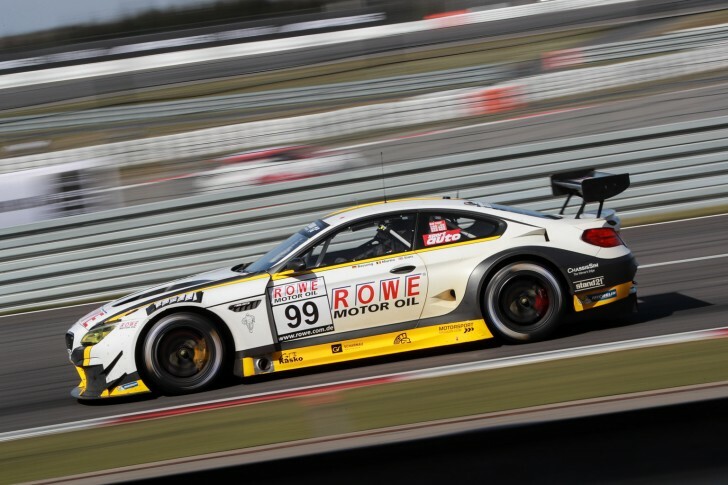 The #98 sister car, driven by Dutch Nick Catsburg, Brit Richard Westbrook and Finn Markus Palttala, experienced the same fuel problem with the BMW M6 GT3, rolling to a halt on the final lap at the Döttinger Höhe, just a few kilometres away from the finish line. Until then, the trio had worked their way up from 29th on the grid into the top 20, despite the fact that the rear apron had been damaged during a collision and been completely removed by the mechanics at the following pit stop. After the VLN season opener, the action will continue now on a weekly basis for the team. Next weekend, the new season in the Blancpain GT Series begins with the first Sprint Cup race in Misano in Italy. On 8th April, the second VLN round is scheduled on the Nordschleife.